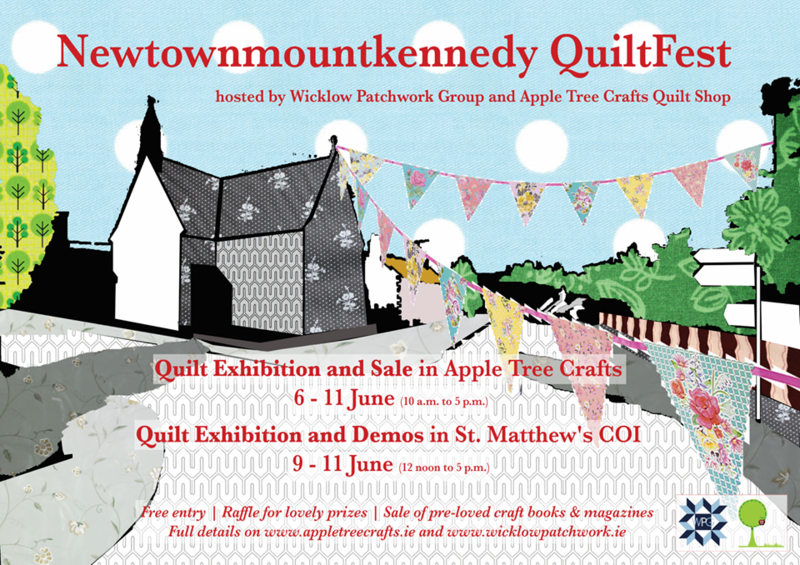 Newtownmountkennedy QuiltFest is a bi-annual event, jointly hosted by Apple Tree Crafts & Wicklow Patchwork Group. See a wide variety of beautiful locally made quilts in 2 locations: Apple Tree Crafts quilt shop from Tues 6th – Sun 11th, 10-5pm, and St.Matthew’s Church from Fri 9th – Sun 11th, 12-5pm. For a very special week in June, we are delighted to show off the beautiful work of our students, customers and the talented members of Wicklow Patchwork Group in both St.Matthew’s Church and our exhibition space above the shop. See a wide variety of designs and techniques, quilts of all sizes and styles, from traditional to modern and everything in-between. The exhibition kicks off on Tuesday the 6th of June in the shop, along with our summer sale. The additional, and incredible venue of St. Matthew’s Church will be added from Friday 9th and we are especially looking forward to seeing this part of QuiltFest. The church is very old and atmospheric and looks amazing when it is full of bright colourful quilts. The stained glass, in particular, is highlighted to incredible effect when the quilts are in situ. We highly recommend you do not miss it. Downstairs there will be demos and opportunities to watch people working on their projects. You will be welcome to ask questions, pick up some tips and maybe even have a go yourself! After all that you will have a chance to win some great prizes in our raffle and pick up some bargains in the craft book and magazine sale. Win a beautiful quilt made by members of the Wicklow Patchwork Group, worth €1200! Also up for grabs are an Apple Tree Crafts voucher, 1 years membership to the Wicklow Patchwork Group, vouchers and other great prizes in our raffle. Tickets will be available in both venues. Have a rummage through our quilt book and magazine sale and pick up some exciting project ideas. We are inviting all members of WPG, students and customers of Apple Tree Crafts to enter your quilt, quilts or quilted items! We want as wide a range of quilts as possible, all levels of skill and ability are welcome. We are limiting submissions to 3 quilts of lap size and over per person with unlimited amounts of smaller quilted items. Please ensure you have a quilt label for each item and a fully completed form. You will find both below. Labels for quilts will print 2 per page and labels for smaller items will print 4 per page. Quilts MUST have a sleeve attached to the back and MUST be labelled properly on the back in addition to the printed label which will accompany each item. All items must also be submitted in a clearly labelled bag. We wish to acknowledge the support and encouragement of Newtown Tidy Towns and Street Feast Groups, Rev. William Bennett in St.Matthew’s COI, and of course Wicklow Patchwork Group. The patchwork group meet in Newtown every 3rd Saturday, membership is full but visitors are welcome at every meeting.